In a scene on Capitol Hill in the new movie "Batman v. Superman: Dawn of Justice," there are numerous fictional senators waiting to hear Superman testify only to be blown up by the evil Lex Luthor. But Sen. Purrington looked familiar to those on the Hill because it was Sen. Patrick Leahy, D-Vt., who is also a devoted fan of Batman comics and has used the Dark Knight and the Man of Steel to help further causes he has supported in the Senate. 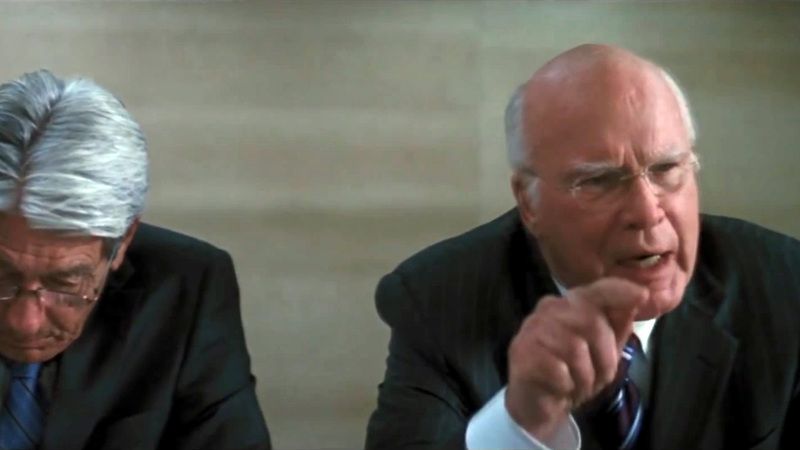 It&apos;s not the first time Leahy has gotten in fisticuffs with a DC Comics villain. The Senate&apos;s most senior Democrat has been in five Batman films. In 2008&apos;s "The Dark Knight," Leahy confronted Heath Ledger&apos;s Joker saying, "We&apos;re not intimidated by thugs," only to be threatened at knifepoint. "He scared the heck out of me with the knife," Leahy said. "I didn’t have to act." Leahy said he was impressed by the late Ledger&apos;s skill. "We’d be sitting around the chow line or whatnot and he’s just joking with everybody," he said. "Then they’d say &apos;Action,&apos; he’d turn into this, very, very menacing person." Leahy also defended the choice of Ben Affleck in 2013 as the latest incarnation of the Caped Crusader and gives his performance high marks. "He comes across with that angry grimness and I think he does it very well," Leahy said. Affleck hinted at Leahy&apos;s role last year at a Senate hearing about the Democratic Republic of Congo. "The role is marginally smaller than mine," the actor said to Leahy. "But I understand you&apos;re quite good." Leahy&apos;s fandom of Batman is so well-known that Sen. Debbie Stabenow, D-Mich., told a radio show that she got a role as an extra in the new movie after speaking with him. Leahy, who was born nearly blind in one eye, said his love of reading goes back to his childhood in Vermont, when his parents, who ran a printing business "encouraged me to read anything I want." He said he would often run to the children&apos;s library to read classics like "Treasure Island" alongside Batman comics. Leahy has hosted two major fund-raisers and movie openings at the Kellogg Hubbard Library and the children&apos;s wing is named after him. He sends royalty checks from film and comic book earnings to the library. Leahy has also used his love of comics in his larger push to end the export of land mines when he asked DC Comics to create a special comic devoted to land mines, for which he wrote a preface. The story, entitled Batman: Death of Innocents , has Batman saving a girl in a conflict zone and trying to navigate through a minefield. "Our point was and I argued for the ending was there are no happy endings with land mines," he said. Leahy said he had the book on every senator&apos;s desk. "A lot of senators read it but they brought it home to their families and they said, &apos;yeah you ought to ban those darn things,&apos;" he said, leading to the bill passing unanimously. In addition, Leahy has written a foreword to the "Batman: The Dark Knight Archives," which was a collection of early comics, and for "Green Arrow: Archer&apos;s Quest." Leahy, who supports Hillary Clinton this election, joked when asked about the 2016 Republican presidential race and the villains in Gotham&apos;s infamous Arkham Asylum. "I look at those who escaped from Arkham Asylum and I think sometimes it’s hard to distinguish them from some of the people running," he said. "But I believe in democracy and I have so much faith in the American people in the end, we will elect the right person." Contact Garcia at EricGarcia@cqrollcall.com and follow him on Twitter @EricMGarcia Get breaking news alerts and more from Roll Call on your iPhone or your Android.